Facebook is planning to make a bulk of its money from advertising, that’s no secret. When you’re logged into the social network you’ll see display ads on the right-hand side of your Newsfeed that loosely fit your interests. The company is also dropping “Sponsored Stories” directly into your Newsfeed as well, so it seems like nothing is off-limits at this point. In the past, the company has used your web history for ad targeting and with the whole Beacon debacle, turned your purchasing and liking into “social ads” that freaked everyone out. It seems like we’ve come full circle since Beacon, as one user has explained how he became an unexpected spokesperson for an item that would make some people blush. Nick Bergus is like any other Internet user, he found something funny online and posted it without thinking twice. If it’s funny it’s worth posting on Twitter or Facebook to get a laugh or two from your friends. You might even get a bunch of likes. Little did Bergus know, his funny post would be turned into an advertisement paid for by Amazon. If you’ve ever spent some extra time surfing around on Amazon, you know that there are some really odd things you can buy on the site. Up until a year ago I didn’t know that you could buy toilet paper in bulk on Amazon, but alas you can. Bergus found something else I didn’t know you could buy on Amazon, personal lubricant. But not just a little tube of personal lubricant, a 55-gallon drum of personal lubricant. I’m not sure how he found it, but obviously he was stoked that he did. This isn’t just a one time showing though, as his friends are telling him that they see the ad every single time that they log into Facebook. Oops. 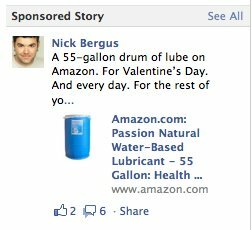 Facebook clearly saw the post by Bergus as a popular piece of data when it came to this product, so Amazon is now paying to have it featured. There’s no telling how many people have seen this ad and recognized him in the photo, but it must be pretty embarrassing for him. So be careful of what you post on Facebook, or you just might become the next spokesperson for it. A little over a decade ago, I bought my 55 gallon drum of lube. I never thought I’d use it all but a few days ago the pump finally ran dry. I’ve had a lot of good times with it. My wife, too. And not just what you’d think. One day I just hosed down our hardwood-floored hallway so I could use it as a slip-n-slide. You shouldn’t think of this as a ‘purchase.’ It’s an ‘investment.’ An investment sure to pay off in spades. What’s the latest news from Facebook right now? TNW Facebook has the answer.